"Can i copy main movie of a DVD disc? I only need to get the main movie for playback on my computer from the disc." A DVD movie disc includes main movie, trailers, footages, menus and others. Generally, when we play DVD disc on our DVD player, we just want to watch the main movie (aka main title of a DVD disc in general) only. It would occupy our time and storage to get a copy of the whole DVD disc. Therefore many people wonder whether they could copy DVD main title or copy DVD main movie only. The answer is without doubt yes. This DVD main title copy guide would show you how to copy DVD main movie or how to freely copy DVD titles you want on your computer in 2 different ways. To copy main title or disired DVD titles, the first thing that comes into head is DVD copy software. There are abundant DVD copy software available, but few of them enable you to copy DVD main title or desired DVD titles as you like. Leawo DVD Copy is a reliable DVD main title copy software you could trust. As a professional DVD copy software app, Leawo DVD Copy offers you 3 different DVD copy modes so as to let you freely select desired DVD content for backup. They are: Full Movie, Main Movie and Custom Mode. 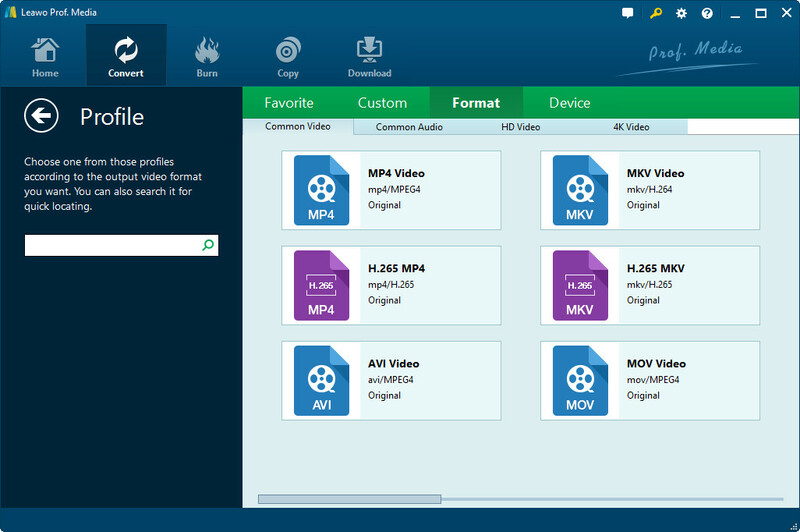 Under the "Main Movie" and "Custom Mode", you could freely choose to copy DVD main movie, or select DVD title to copy DVD main title or desired DVD titles for backup with ease. What’s more, you could even select subtitle and audio tracks for copying DVD main movie or main title. Download, install and run Leawo Blu-ray Copy on your PC via the links above (You’re downloading the ultimate app, in which Leawo Blu-ray Copy is included as a function module). Get source DVD disc ready. Insert source DVD disc into DVD recorder drive. Launch Leawo Blu-ray Copy, open the "Copy" tab, and click the "Add Blu-ray/DVD" button to load DVD disc from DVD disc drive. Note: If you want to copy DVD main title to DVD disc, you need to insert a blank writable DVD disc into the other DVD recorder drive or create an ISO image file (detailed information listed in Step 3). After adding DVD disc, move mouse to the bottom left corner to choose "Main Movie" or "Custom Mode" copy mode and set output disc type from DVD-9 and DVD-5.You could select subtitles and audio tracks here. Note: Main Movie moade means to copy DVD main movie (the longest title in DVD disc by default). Custom Mode enables you to select desired DVD titles for copying, in which you could select to copy DVD main title or copy DVD titles you need. Main Movie mode allows single choice, while Custom Mode allows multiple choices. Click the big green “Copy” button. On the popup sidebar, set “Copy to”, “Disc Label” and “Save to” option. To copy DVD main movie to DVD disc, insert a blank writable DVD disc the other DVD disc recorder drive and choose it as output under the "Copy to" option. If you only have one DVD disc recorder drive, choose to create an ISO image file by clicking the "ISO File" option under the "Copy to", and then follow the Step 5 and Step 6 below to copy created ISO file to blank DVD disc. To create ISO file or DVD folder for copying DVD main movie to computer, you need to set output directory under the "Save to" box. Make sure target drive get enough storage. Click “Copy” button on the right sideba to order this DVD copy software to copy DVD main title. By following the above steps, you could copy DVD main movie into ISO image file. After that, eject your source DVD disc, and then insert a blank writable DVD disc into the drive. Under the "Copy" tab of this program, click the drop-down arrow icon next to the "Add Blu-ray/DVD" button and then select "Add iso file" option to load created ISO image file. There pops up an “Add iso file” window. Set DVD recorder drive as target in "Copy to" option and enter "Disc Label" name for output DVD disc. Click the “Burn” button to start copying ISO file to DVD disc. It’s done now. Note: This tutorial offers only feasible solutions to copy DVD movies, with no intention to encouraging you to break local laws for removing DVD disc protection. So, check your local law upon DRM protection first and make sure you’re copying your own DVD discs for no business purposes. After you download the abovementioned DVD Copy, you must find that there is a "Convert" function module, on which an "Add Blu-ray/DVD" button is available. That’s Leawo’s DVD Ripper, a professional DVD ripping software that could help you easily rip and convert any desired DVD title or DVD main movie for backup on computer. Different from DVD Copy that retains the original DVD format, DVD Ripper helps convert DVD to video for copying. 1. Insert DVD disc into DVD recorder drive and then open the "Convert" tab to click "Add Blu-ray/DVD" button. Upon loading, you’re provided with 3 different loading modes: Full Movie, Main Movie and Custom Mode. Select Main Movie or Custom Mode. 3. Click the big green "Convert" button on the main interface. On the popup sidebar, set an output directory to save output DVD main movie or DVD main title(s) in the "Save to" option. 4. Click the bottom "Convert" button on the popup sidebar to start converting DVD main title or main movie to your computer. Rip DVD disc/folder to video in MP4, AVI, FLV, MKV, etc. Convert DVD to MP3, AAC, FLAC, and other audio files. 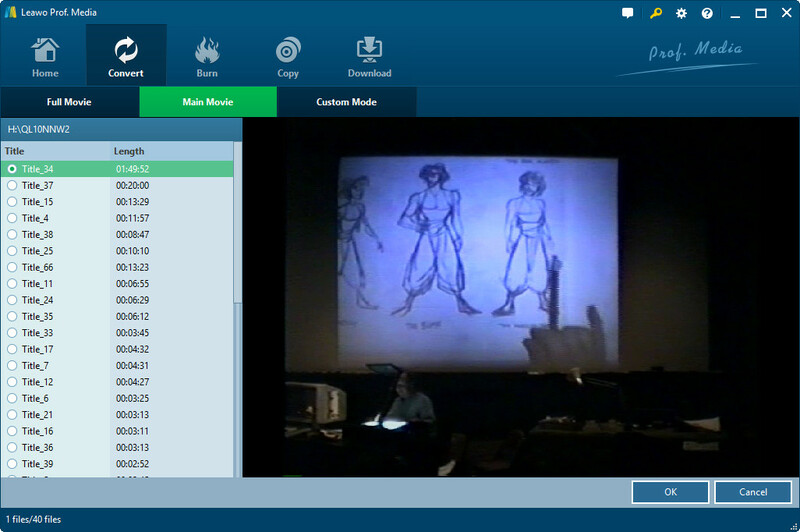 Edit video files: trim, crop, add watermark, change effect, rotate, etc. Convert DVD to iPhone, iPad, Android device, YouTube, etc.